« Sudoku Xtra 9 puzzle magazine now out! 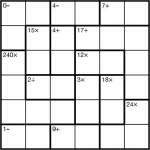 This entry was posted by Gareth Moore on August 17, 2010, and is filed under CalcuDoku. Follow any responses to this post through RSS 2.0. You can leave a response or trackback from your own site.